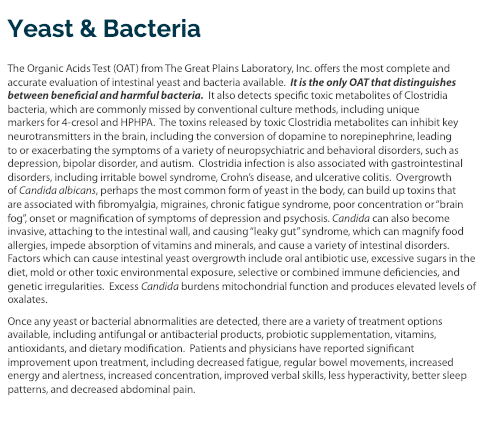 The Organic Acids Test (OAT) offers a comprehensive snapshot with 74 markers of a patient’s overall health. The test measures organic acid molecules called metabolites. These metabolites are really just by-products of cellular activity, food digestion, and metabolism in our digestive tract. Specifically we get a read of yeast and bacterial overgrowth, vitamin and antioxidant levels, fatty acid metabolism, neurotransmitter levels, oxalate levels, mitochondrial function, oxidative stress, detoxification and more. Patients with chronic diseases, neurological conditions, or allergic issues will typically have some abnormal levels. This can signal a cause or worsening of behaviour disorders like hyperactivity, movement disorders, fatigue and immune function. If anything abnormal is detected using the OAT, treatments can include supplements, such as vitamins and antioxidants, or dietary modification. Patients typically report significant improvement such as reduced fatigue, improved bowel function, increased energy, increased concentration, improved verbal skills, less hyperactivity, and decreased abdominal pain. 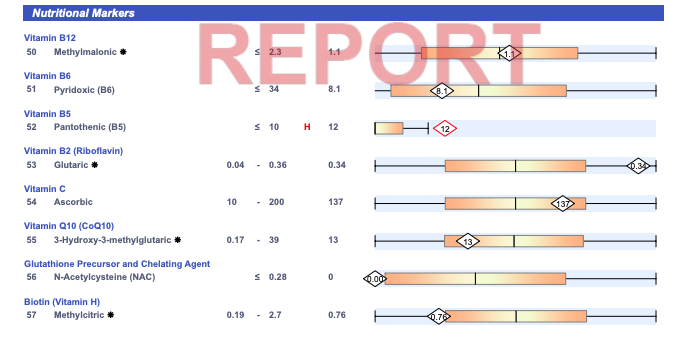 See the snapshots below to get an idea of what your test results may look like. We can get a ton of interesting and helpful information about your body from running this test. The OAT is strongly recommended as an initial screening test to identify any potential underlying health issues and optimize well-being.